At last! It came in at 33 minutes long! My masterclass tutorial on how to superdetail a scale model aircraft cockpit is now available on YouTube. In this video I show you how to elevate your model cockpit, from a boring kit-standard version to a chock-full-o'-detail version, using mostly wire offcuts and spare bits of styrene strip and rod. It is a cheap, effective, and personally satisfying way to make the pilot's office a much more professional looking piece of your model. Cockpits are usually the most visible bit of detail on a plane. Certainly for a P-51D Mustang, with it's gorgeous but very open bubble-top canopy, you need to make sure you do justice to the cockpit. My kit is the ancient Hasegawa 1/32 P-51D Mustang. 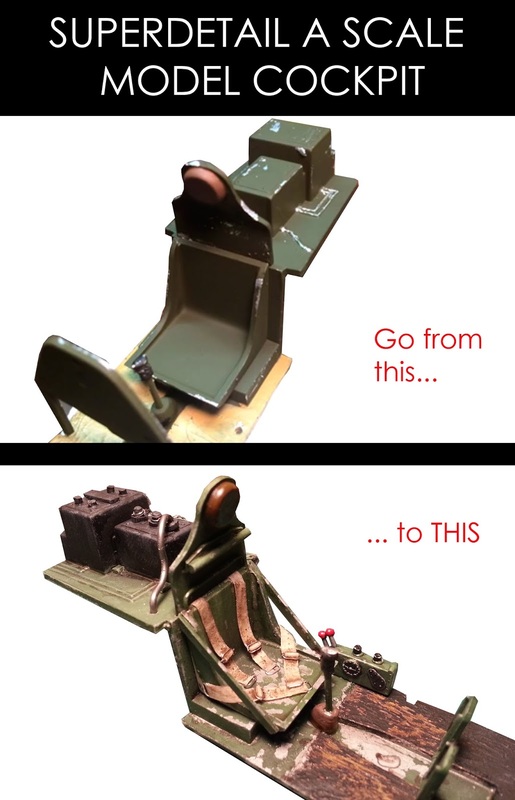 Just check out the difference a little judicous scratch building can make by comparing the kit-standard cockpit below. So get comfortable, relax, and enjoy the video. I hope it is full of inspiring ideas for your own builds.